My Aunt Sally (who did our wedding flowers and arrangements five years ago) recently re-launched the website for her business, Natural Designs, and I couldn't resist sharing it with you because I think some of you naturalists out there might really enjoy it. I've been told it's a work in progress, but I really like where it's going. One of my dad's six multi-talented sisters, Aunt Sally is essentially the much-less-fussy Martha Stewart of the Amish community -- or maybe Martha if she were less of a brand and more of a "real" person. 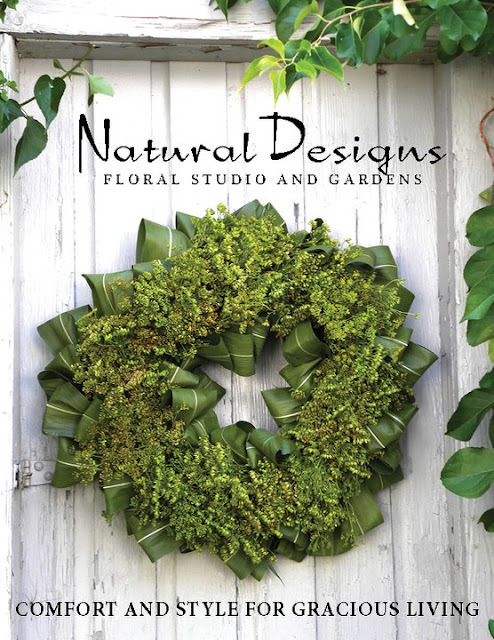 Her site is all about incorporating nature into your lifestyle through decorating and design, cooking, gathering, etc. Her website has how-tos, recipes, tips and so many pretty photos of her work and of the Amish valley where she lives, just a few miles from where I grew up. I've clicked all through the site several times in the past week just enjoying the rustic beauty of it and the nostalgia for home. "Rustic" (if that's the right word) is sort of a trend in decorating and especially floral design right now, but this is much more authentic and effortless than that. There's no gimmick behind it. The vast majority of her materials are grown and gathered in her own backyard -- no need to harp on about sustainability or buying organic or local, because that's just part of it. In this way, Natural Designs is more reflective of a way of life than a particular style -- which is refreshing to me. I'm reading fewer and fewer blogs these days, because it seems so many bloggers are trying to be the next big thing and create a niche for themselves that doesn't seem to suit who they really are. I don't want to discourage people from pursuing their dreams and trying new things, because that's part of the great fun of having your very own blog, but it doesn't take long to separate the authenic from the inauthentic. And authenticity is so much more engaging, even if you're not quite sure why. I don't know if I'm just looking at the site and the photos through the lens of a biased family member, but I think she has something special going on here. This is all so pretty, right? Side note: at Aunt Sally's suggestion we used a lot of corn leaves in our wedding, and to me they look like a natural version of grosgrain ribbon. (And -- bonus! --if you or a neighbor grow any corn, they're totally free. Love that.) More great ideas at http://www.naturaldesignsstudio.com/. ooh thanks for sharing! this looks like a great website! her wreaths are gorgeous. We just stumbled across your blog post about our website, and found it very inspiring and supportive. Thank You for believing in our cause! By the way, how's little Johnnie doing?